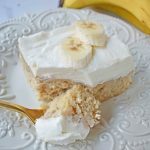 Jeff’s BEST Banana Cake Recipe is a moist and tender banana cake with a creamy, sweet and buttery cream cheese frosting. Some say it is the best banana cake in the world and I may just agree. I take my baking pretty darn seriously. 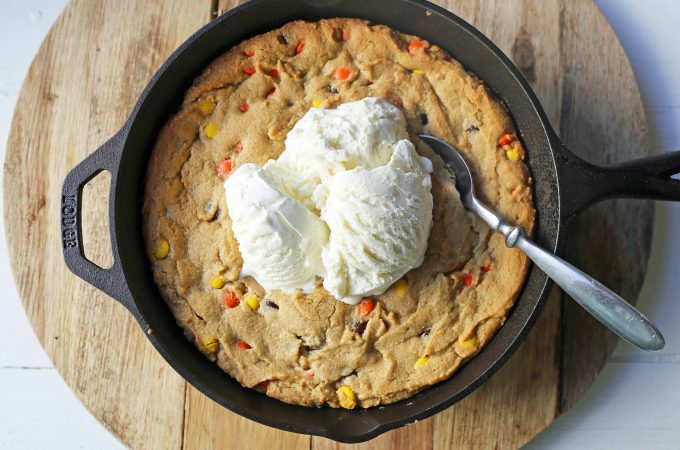 My cakes and cookie recipes have to be top-notch. 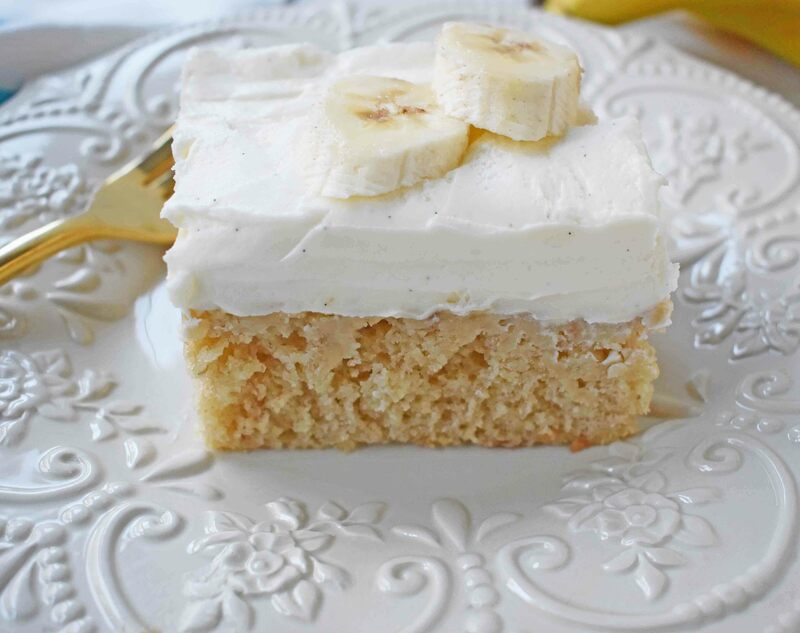 This banana cake with cream cheese frosting is one of the most crowd-pleasing cake recipes. 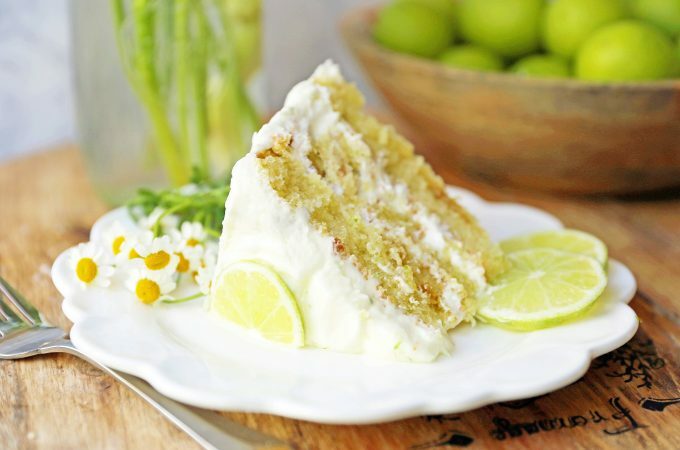 It is beyond moist and it almost melts in your mouth! Let me introduce you to my older brother, Jeff. He can also be called by one his nicknames in high school — “Chef Jeff.” To know Jeff is to love Jeff. He literally has a heart of gold. Ever since he was in high school, he has been making goodies for his friends. I could write an entire post about all of the little and big things he does to help others but I will keep it short and sweet. He received a call at church to work with the youth ages 12-18. He thought he would try to bribe them to listen to his lessons by bringing homemade baked goods every single Sunday. No joke. He could have just picked up doughnuts from the store, which would make his job extra easy or ask his wife to make them; yet, he actually made the homemade goodies for his boys. Unreal. When we were visiting San Antonio recently he told me that he has a secret recipe. He has been making the best banana cake with cream cheese frosting for years without sharing the recipe with his only sister. How can it be? Thankfully, he is as nice as he seems and as soon as I asked for it, he gave the recipe to me. He told me stories about how people would track him down to get this coveted recipe from him. He said that it is always incredibly popular and told me it is one of his favorite cakes of all time. I wondered if it could really be that good. I decided to make the banana cake recipe as soon as my bananas became perfectly ripe. Oh my word. If only there was a camera on me to get my reaction when I took the first bite. 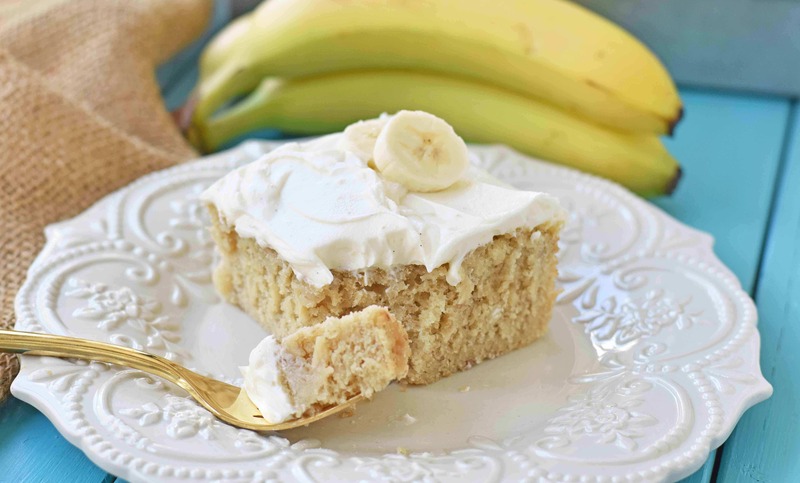 This homemade banana cake recipe is downright heavenly. What I noticed first is how creamy and moist the cake is and how it just melts in your mouth. 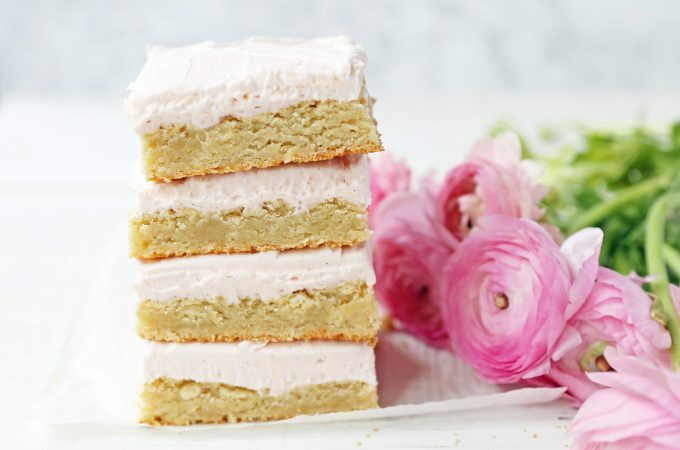 The cake is so soft and tender and the creamy and buttery cream cheese frosting is smooth as silk. It is really THAT good and then some. It begins with butter. You know how I feel about butter. 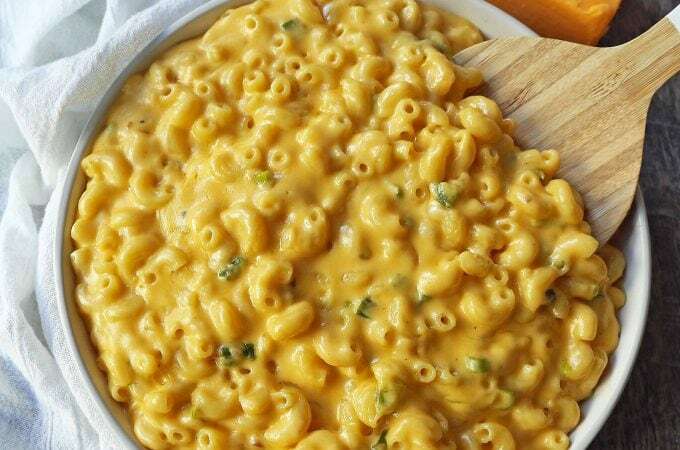 Buttery truly makes everything better. 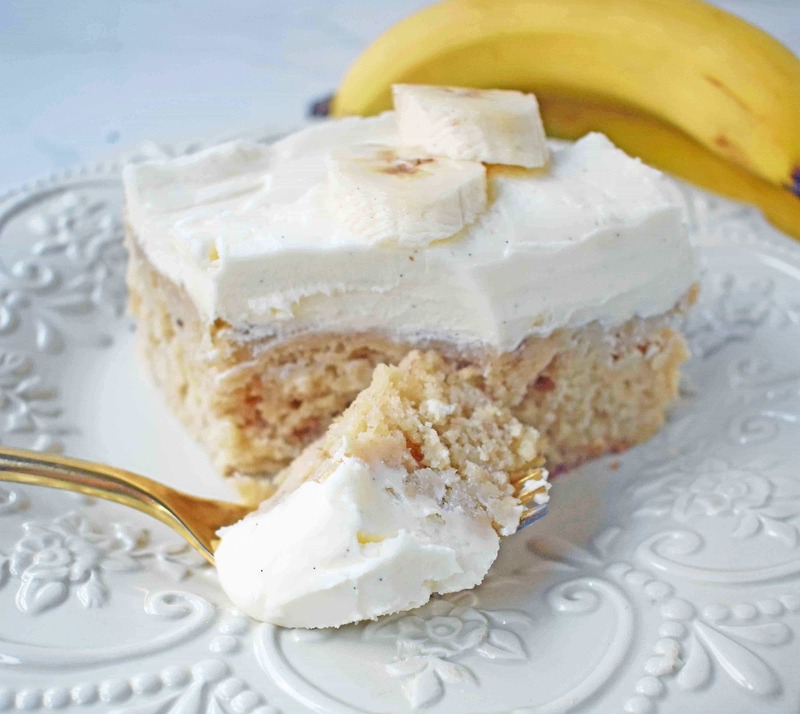 It brings so much flavor to this banana cake. Ripe Bananas. This is an essential component to phenomenal banana cake or bread. You must use over-ripe bananas with black spots. When you see those black spots on the yellow peel, that is all flavor. It brings so much natural sweetness to the cake. If your bananas aren’t quite ripe enough, place in a brown paper bag and in a dark place. Sprinkle fresh lemon juice over mashed bananas. 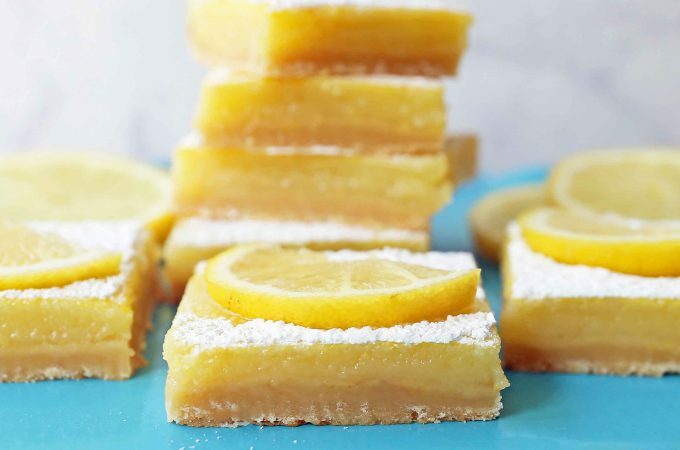 It helps bring some acidity to the cake and keep the bananas from turning brown. Use Buttermilk. It is a true miracle worker in baked goods. It helps to create such a tender texture. The beauty of it is that it has the same amount of fat as 1% milk yet is so thick and creamy. Bake at a low temperature. Low and slow wins the race here. Bake at only 275 degrees for about an hour. A mix of cream cheese and butter in the frosting. This frosting should be illegal. 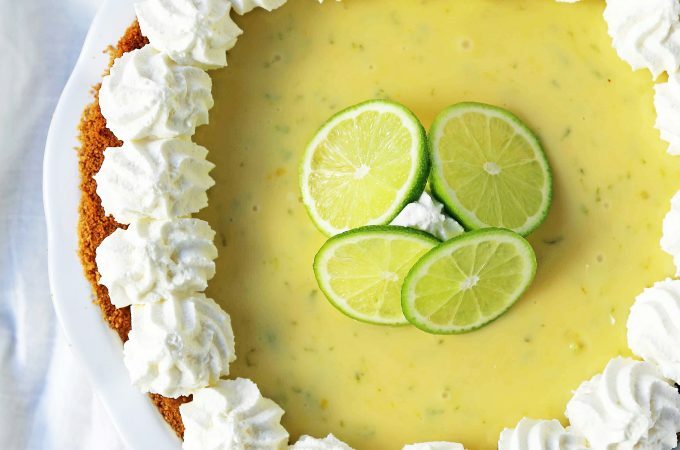 It has the perfect balance of butter, softened cream cheese, and powdered sugar. 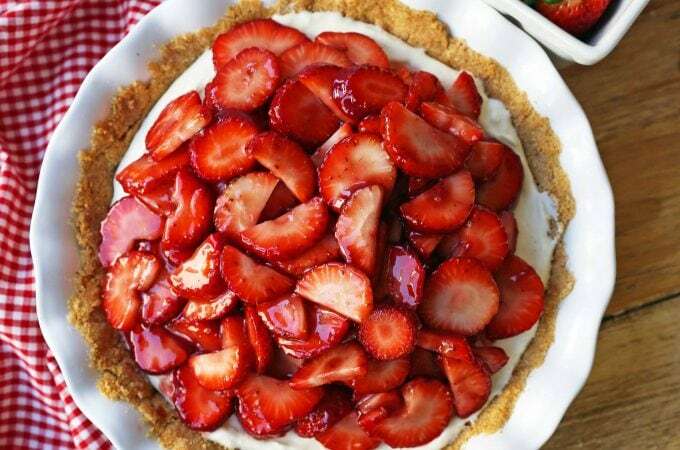 I just want to lick the entire bowl. 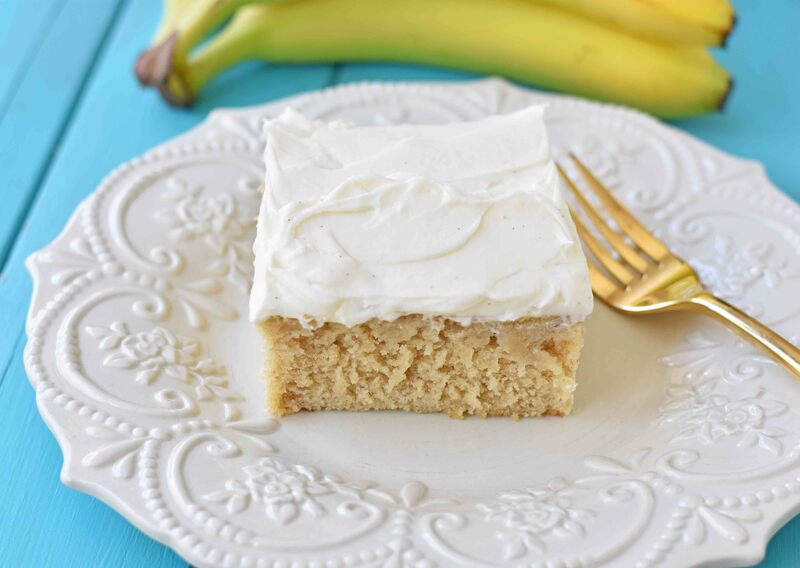 This best banana cake is made in a 9 x 13 pan. I am such a huge fan of my USA pans. When I lived in Texas, I bought them in all sizes at the Williams Sonoma outlet. Now, Amazon carries them and are even cheaper than at the outlet. You can buy one HERE. 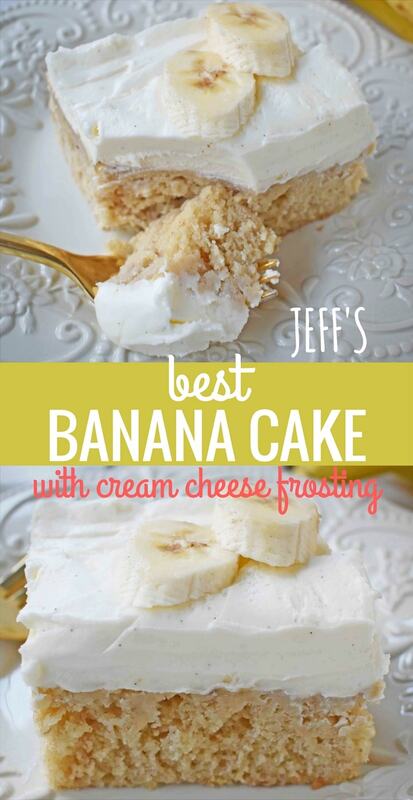 Another huge key tip to making Jeff’s BEST Banana Cake in the freezer as soon as you pull it out of the oven. It may sound crazy but it helps to keep it moist. So if you can, clear out a space in your freezer for a 9 x 13 pan and place it in there for one hour. 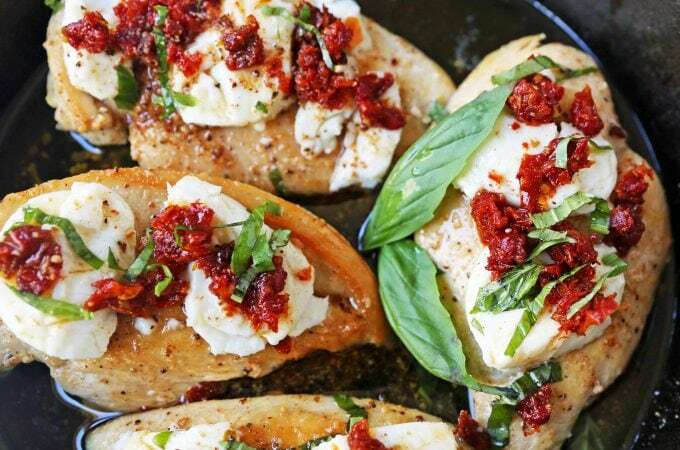 Place oven mitts underneath pan. Remove it from the freezer and frost it with the ultimate cream cheese frosting. 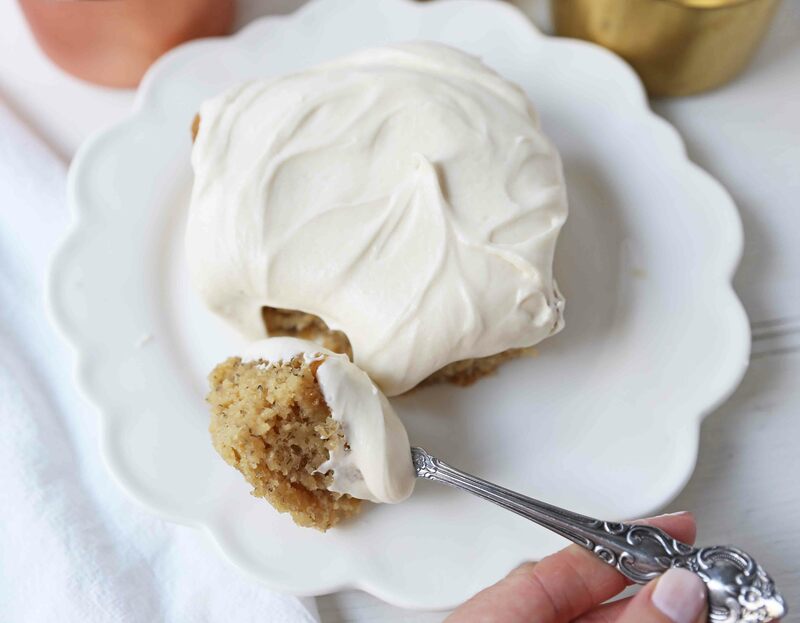 You can use vanilla extract or even vanilla beans in the cream cheese frosting. I save my beloved vanilla beans for frosting and custards since you can really taste the flavor. Nielsen-Massey makes a killer vanilla bean paste which is heavenly in frosting. 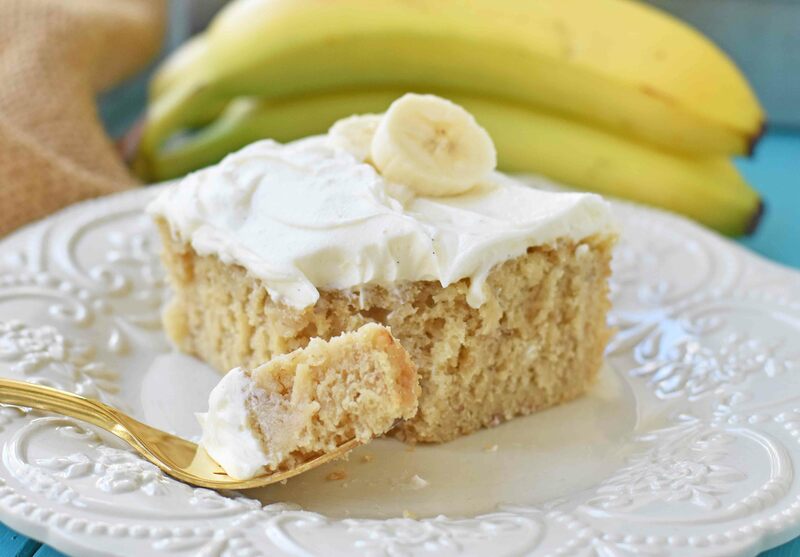 The best banana cake is moist and tender cake with a sweet and buttery cream cheese frosting. 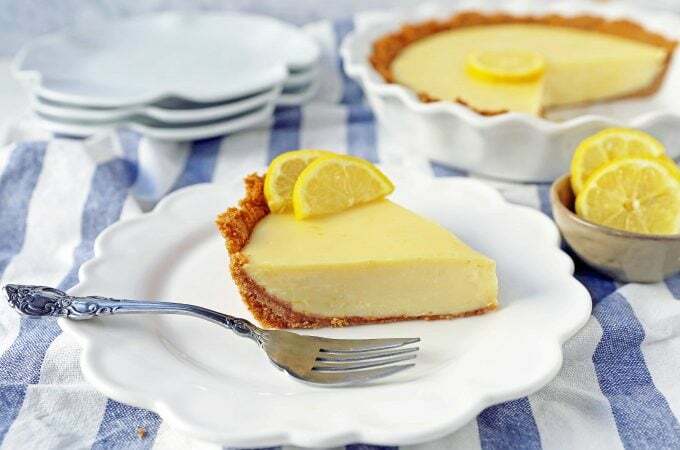 In a large mixing bowl, cream butter, sugar, and brown sugar for 5 minutes or until light and fluffly. Add eggs one at a time, mixing in between. In small bowl, mash bananas with lemon juice. Add bananas to bowl and mix well. Add flour, baking soda, baking powder, and salt. 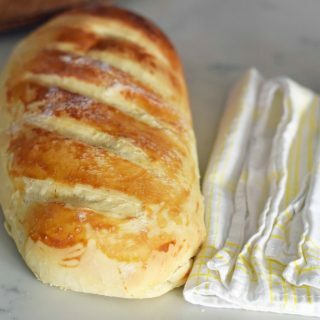 Bake for 55-60 minutes or until baked in the middle. Optional: place in freezer for 45 minutes - 1 hour to keep moist (put oven mitts underneath pan). 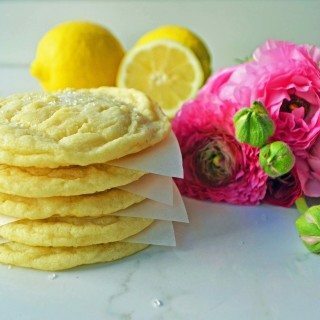 Cream butter and cream cheese for 3 minutes or until light and fluffy. Add powdered sugar and vanilla and mix together. Spread frosting all over cake. This is what I know. I will never, ever, ever make another banana cake recipe. This is perfection right here. Thank you, Jeff, for sharing your favorite best banana cake recipe and for being such a good human. I am so lucky to be blessed with 5 incredible brothers. 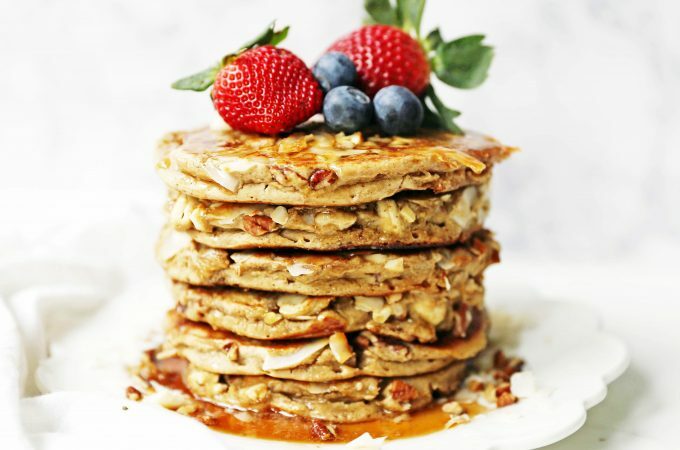 How do you keep the hot cake and pan from melting the rest of the frozen stuff? Just wondering…. 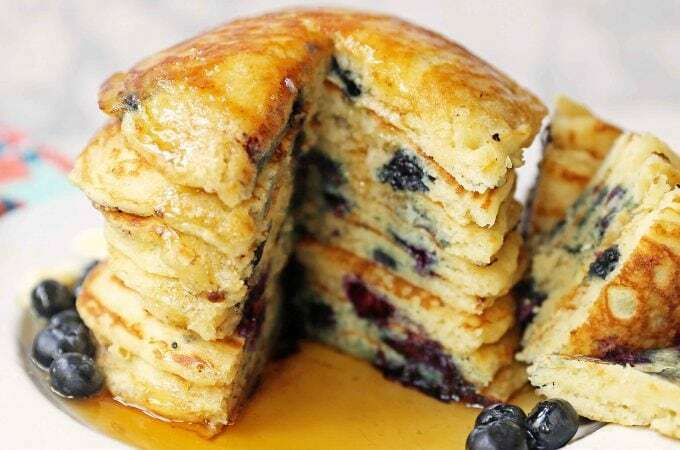 Mmmmm….so very delicious!!! Interesting about how the lemon juice keeps the bananas from turning brown. That worked! 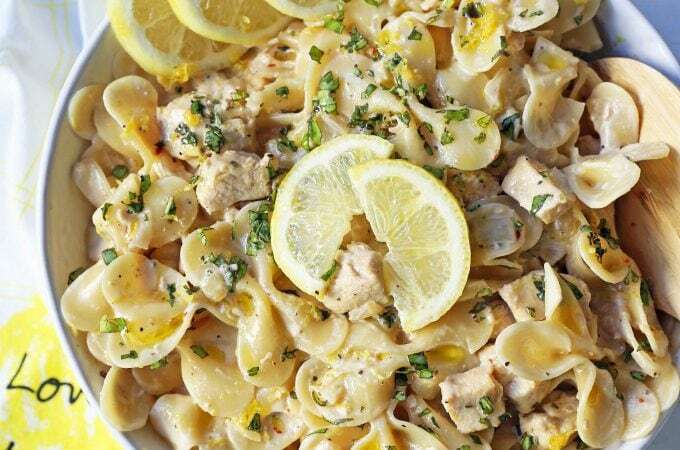 Thank you very much for this delicious recipe. Just connecting with your tasty recipes-can’t wait to try the cinnamon rolls! 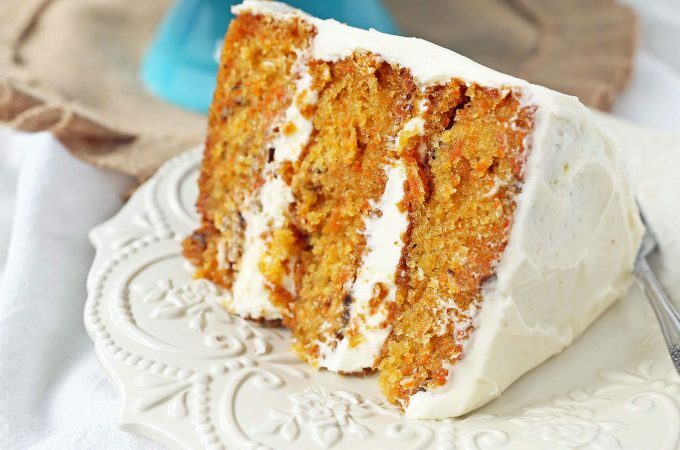 Did you use salted or unsalted butter in Heff’s Banana Cake? Trying that this weekend! I made this cake last night and it was delicious! I do have a question though…my cake is tall, like to the top of the 9×13 glass pyrex dish I baked it in. 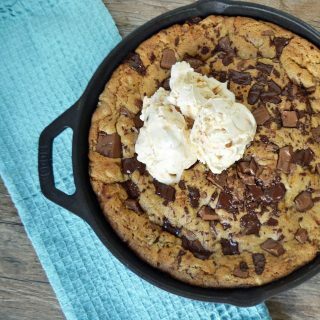 From your photos, your cake looks like it was maybe baked in a cookie sheet or jelly roll pan.? I did have to bake my cake quite a bit longer than the written time (about 20 minutes longer) and the frosting doesn’t sit within the dish because it is so tall. I live in Utah just outside of SLC. It has been a little more cool here during the day lately…60s and low 70s. I made it in the evening though. When I poured the batter in the 9 x 13 pan, it filled it 3/4 full. Once it was baked it was up to the top of the pan. One other note about the frosting…I often use 1/3 less fat cream cheese and I used that in the frosting. I used all ingredients as written but the frosting was quite soft which I am sure is due to the lower fat of the cream cheese. Next time I’ll either go with the regular cream cheese or add more powdered sugar (with the 1/3 less fat cream cheese) to make a stiffer frosting. I snuck a piece off the end of the finished cake just to see how it tasted. 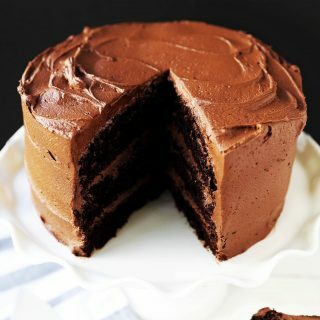 It is wonderful, tasty and moist. I haven’t even frosted the cake yet and it’s great. I didn’t take the step of putting the cake in the freezer as I have no room right now but can’t imagine it being any more tender or moist. I’ll bet when it’s frosted it will be amazing! 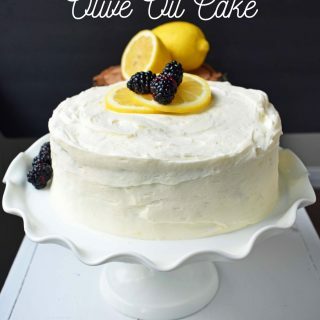 I’m going to make this cake soon and can’t wait! I’m sorry, I know this is a silly question, but I was wondering if you used purely cake flour for Jeff’s banana cake recipe? or did you use All Purpose Flour? 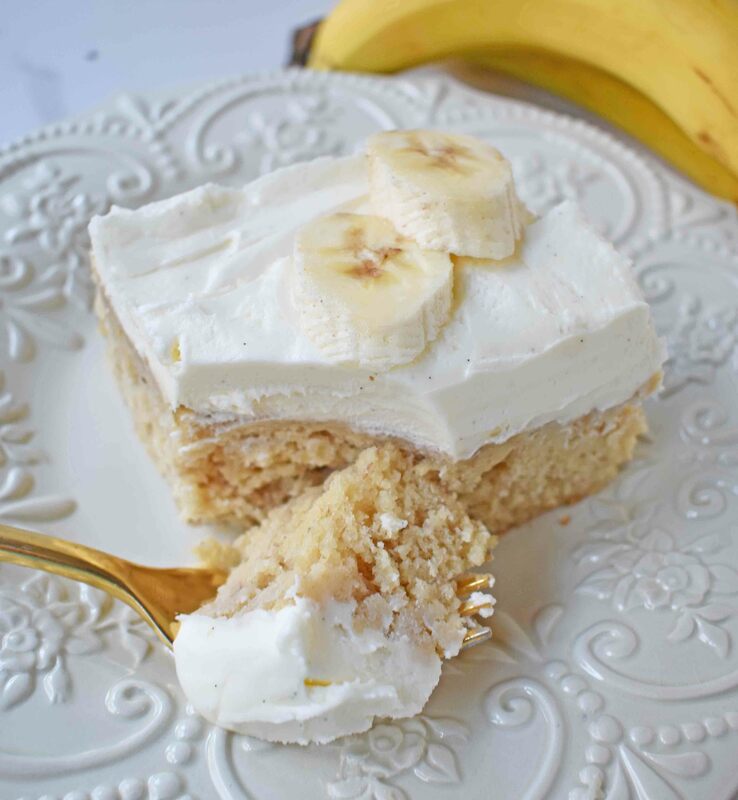 I make this cake regularly and it’s 1-1/2 cups mashed bananas. The cake is delicious. I forgot to use the brown sugar. Completely missed it. I use all white sugar. However, my cake baked 2 hrs and 15 min. in my new oven. It is delicious. Hello! 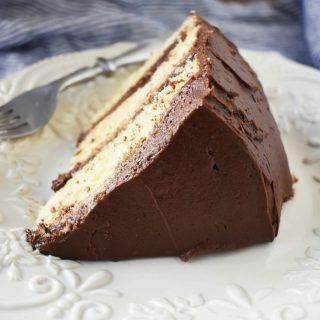 I plan on using this recipe to make a chocolate /peanut butter/banana layered cake for a friends birthday next weekend. I was going to use two round 6″ cake pans, and cut each one in half. (I am assuming this recipe will have no problem making enough for two 6″pans.) 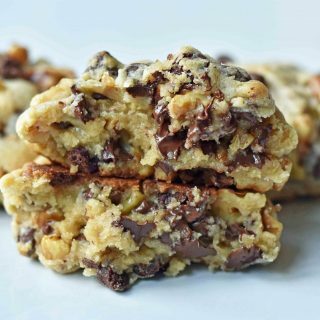 Do you have any recommended changes to the baking time or temp? Any other tips regarding making this into a layered cake are enthusiastically welcomed as well. (; thanks! 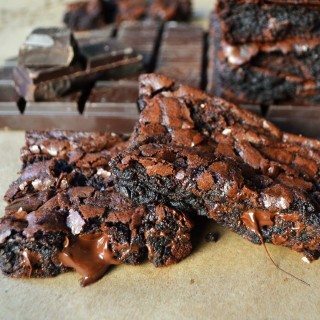 How would you adjust baking time if mKing muffins? Great tasting cake!! I tried baking it two different times at 275 for 60 minutes and had to finish baking it at 350 for another 20 minutes. I think next time i will just bake it at 350. I am planning to make this cake for my boyfriend’s birthday but wanted to make it into cupcakes. Have you ever tried this? Would you recommend any alterations if doing so? I just made this and at 60 mins it’s not done yet. I just added 15 more mins. I was super excited but I am really getting worried now. Made this for a party tonight. (I used a whipped cream frosting because I’m not a big fan of cream cheese frosting.). 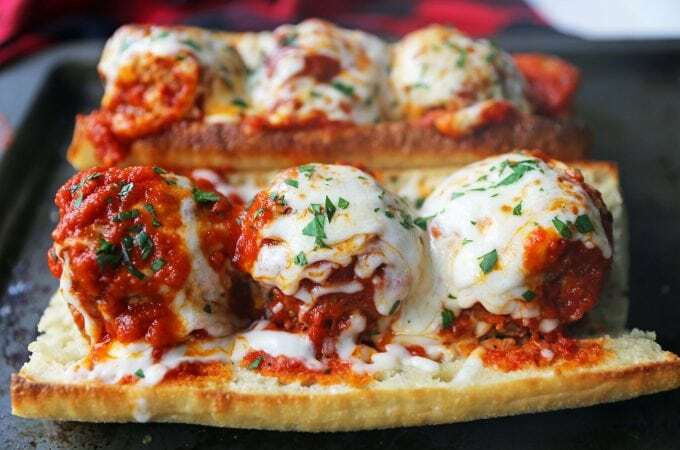 It was delicious and a hit at the party! I cooked it at 275 for 60 min, but it wasn’t done, so I cranked it to 325 for about 15 min and it came out perfectly. This is a keeper! Will definitely make it again.